Description: New Acer laptop upper case palmrest. 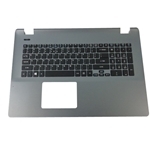 This upper case is grey in color and it includes the keyboard (non-backlit). This may be the part you need to replace your cracked or broken palmrest. Compatible Part #'s: 60.MP8N7.028, EAZYW00102R. Acer Aspire E5-731, E5-731G, E5-771, E5-771G.